Click here for information on travelling to Orkney. Click here for details of internal bus and ferry timetables. Orkney is a group of 70 or so islands, of which 17 are currently inhabited. 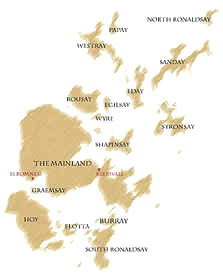 Orkney can be divided into three distinct regions - the North Isles, the South Isles and the Mainland. Of the islands, less than one-third are inhabited, the islands having a total population of 19, 245 (2001 census). The majority of people live on the Mainland, with the greatest population concentrations being around the main towns of Kirkwall and Stromness. The Mainland is divided into two "halves" - these are known locally as the East Mainland and West Mainland. The islands are low-lying, gently sloping and richly fertile with the exception of the island of Hoy, which is high and rugged. The climate is temperate, warmed by the Gulf Stream; with the driest months being April, May and June.